When you decide to permanently move from one place to another, it is imperative for you to move the things that you own as well. Getting professional help from a moving company is the best option at hand especially if you need to move items or equipment from your office space or residence to another location. Creating a moving company contract can be very helpful if you decide to hire a moving company as the specified document can ensure you that all the specifications of the moving transaction are documented and agreed upon by all the parties involved. Developing a functional and effective moving company contract is not an easy task. However, having the right and appropriate references can help you create the document in the most efficient way possible. 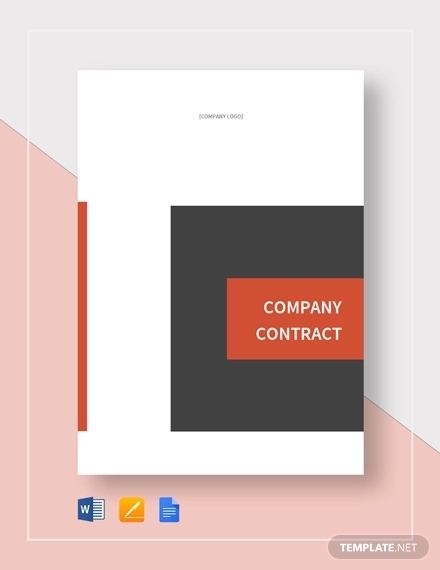 We have collected and put together several moving company contract template examples that you can use as formatting guides if you already want to draft your own moving company contract. The completion of the content of your moving company contract must be highly regarded as it can affect how the document will perform during actual implementation of plans of action. Developing a comprehensive moving company contract can also reflect the preparedness of all parties involved as there is already an understanding of the service particulars that are expected to be delivered accordingly within the duration of the transaction. The abovementioned information are only basic details that you can also use when making a simple moving company contract. Do not limit yourself from adding or removing items on the list. Base your content inclusion on the requirements of your own moving company contract. A film production contract and any kind of business contract are essential in corporate and professional transactions. No matter what industry it is that your business belongs, you have to make sure that you will prepare a contract that your clients can browse through, review, evaluate, and agree with so you can promote a smooth flow of business processes and overall transaction. A moving company contract can give you access to all the information that you would like to see, review, or check anytime you like to. 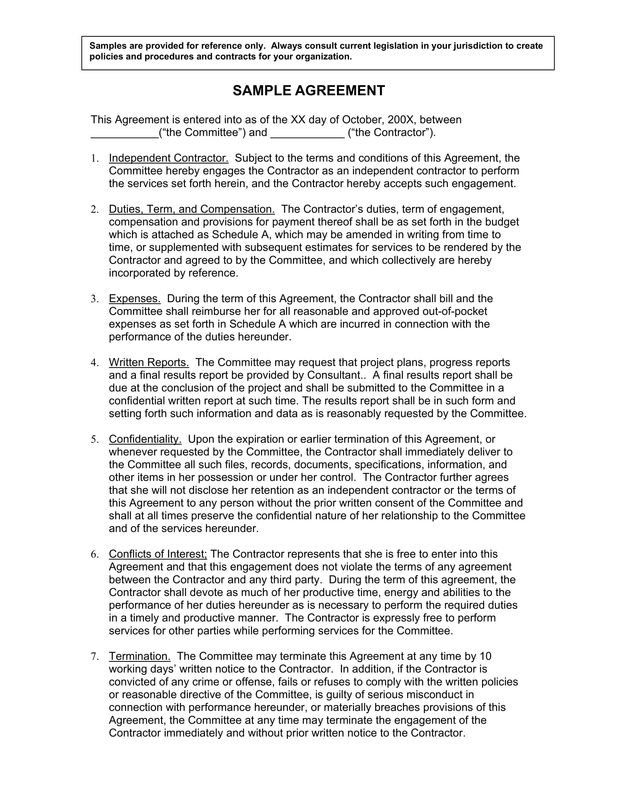 Since you and the service provider will have a copy of the specified document, you can ensure that no changes in the contract’s content will be made after you and the business have already affixed your signatures. Being knowledgeable of all the details of the transaction can help you become more secured when it comes to the transparency and reliability of all moving work processes. 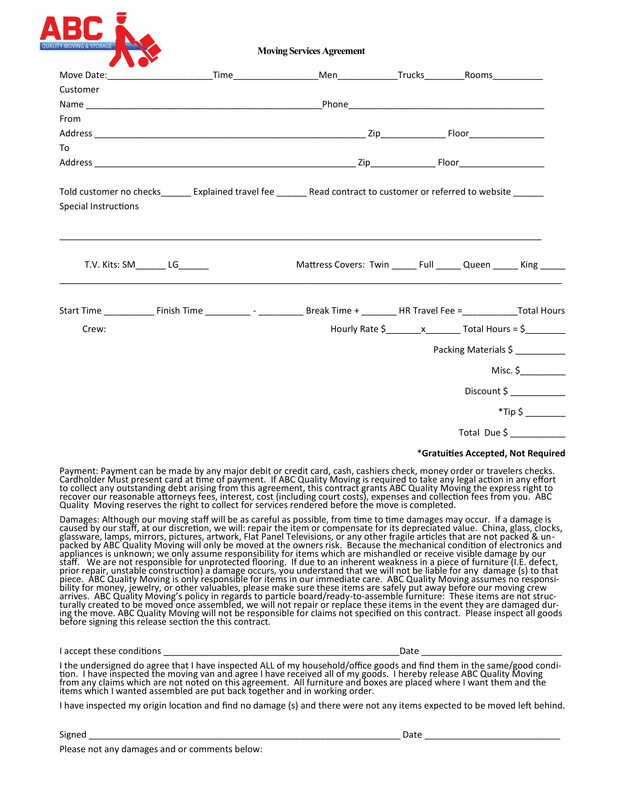 A moving company contract can help you formally communicate with the business in a written manner. Since you have agreed upon with the content of the moving company contract, the rights of the business can be protected just as how your rights are looked into and considered. 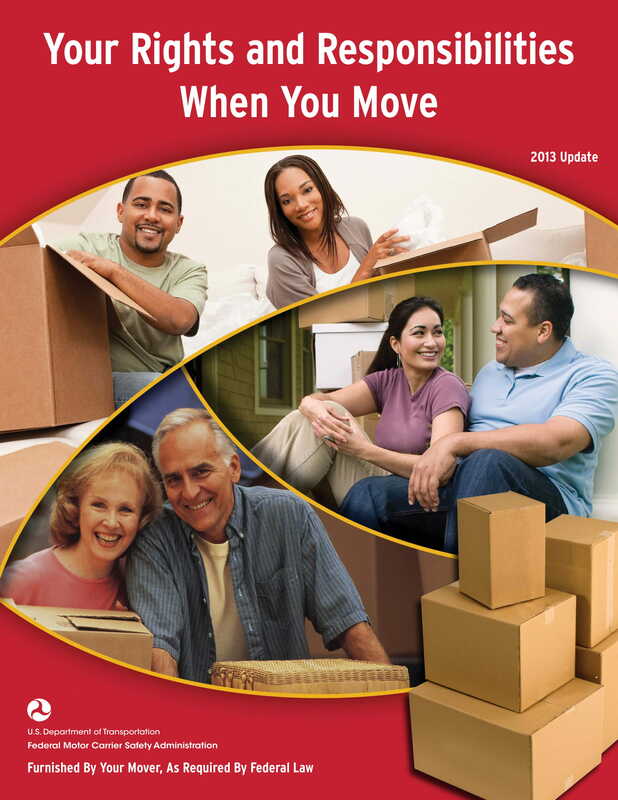 With this, you can establish a healthy relationship with the moving company. A moving company contract can directly give all the details about the responsibilities of each party with one another. Developing and using a complete and detailed moving company contract can enable you to list down everything that all involved parties must know from the payment terms and methods up to the scope and limitations of the moving services provision. A moving company contract can give you an idea about the timeline that will be followed when moving your items, equipment, and/or materials. The timeliness of the moving processes must be considered as this can actually affect the pricing or costing of the services that the business will provide. More so, particular moving processes can actually be time-sensitive, which is why deadlines must be established and agreed upon by all the entities within the transaction. 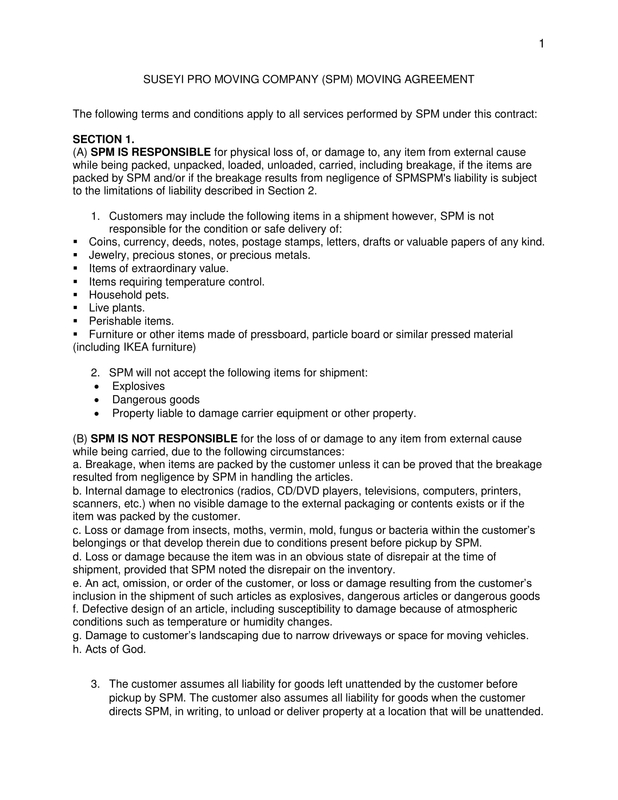 Why Use a Template When Making a Moving Company Contract? 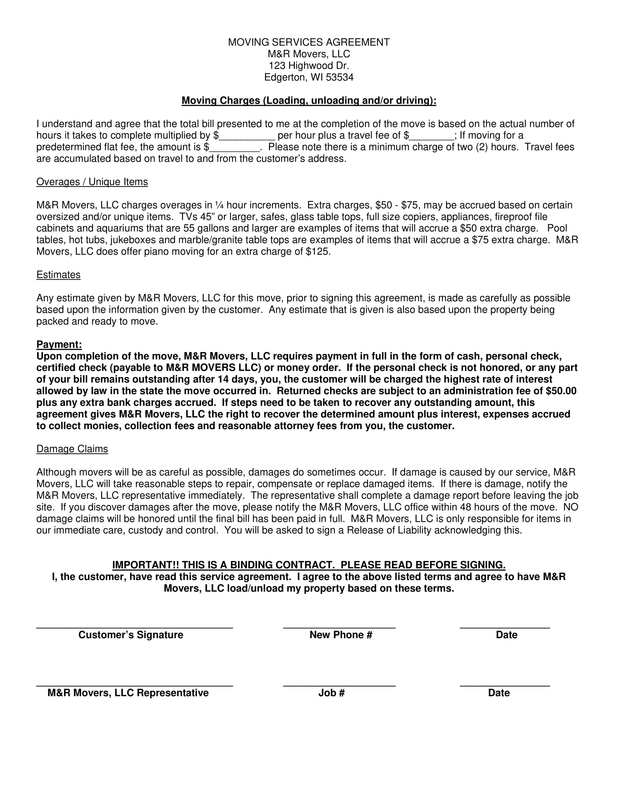 Using a moving company contract template can help you format the document accordingly. It will be hard and challenging for you to develop a layout on your own especially if it is your first time to create the document. Having formatting guides when making your moving company contract or any other contract agreement letters and contract document can allow you to easily put together all the content of your discussion with ease. 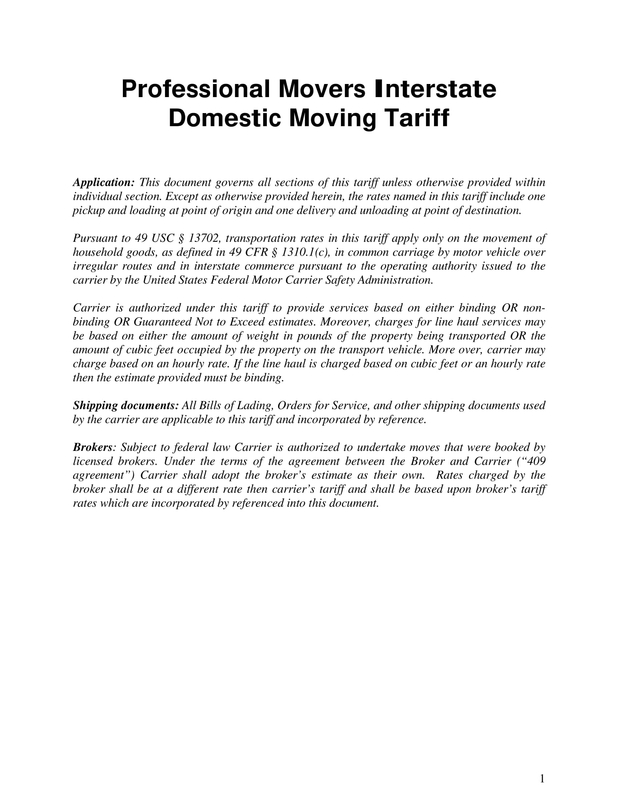 Using a moving company contract template can give you an idea about the flow of your discussion. Together with an outline and other kinds of organizational tool, having a template that you can refer to when making your moving company contract can let you become more keen and observant with how you present your offers and contract terms. This can make the document easier to browse through and understand by any reasonable person that you will be working with. Using a moving company contract template can actually affect the processes of content development and updating. If you already have an organized listing of your moving contract specifications, then it will be more efficient for you to incorporate changes in the contract as your discussion with your client develops. The more properly formatted your moving company contract is, the faster you can tweak certain information based on the most up-to-date agreement that you have with the party on other end of the agreement. 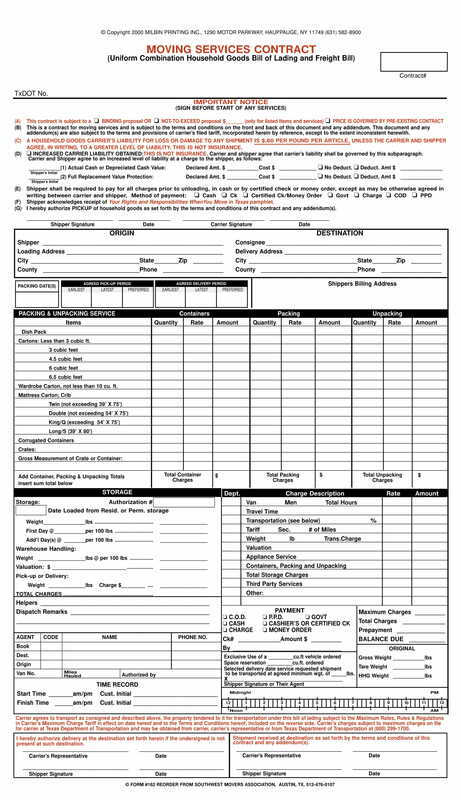 Using a moving company contract template can make it easier for you to put all the essential details that are expected to be seen in the contract document together. As we have mentioned in the discussion above, the completion of all the details that the clients need to know about your moving services is an essential factor that you always have to look into when making the specified document. Having a reliable and highly usable template at hand can allow you to know whether there are information that are still lacking in your presentation based on the format gaps seen in the document that you are developing. 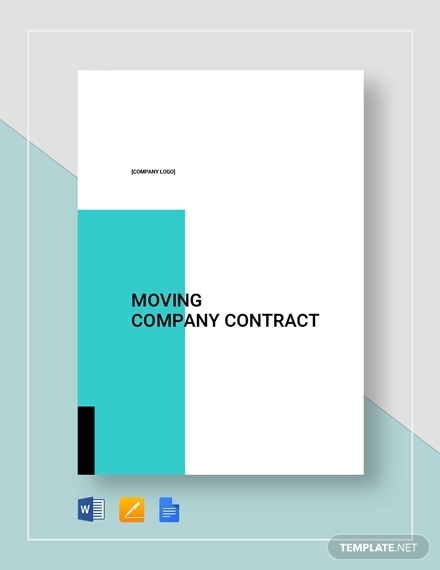 If you are a business who wants to develop a moving company contract, the first thing that you must do is to browse through and review the previous moving company contract examples of your business. In this manner, you can be aware of how your business presents its moving services. This can also help you identify the things and document clauses that you can change or improve so you can create a more efficient and more effective moving company contract. As a business, allow your team members to review the final moving company contract that you made. This can further improve the formatting and content specification of the document as there are more people who can evaluate the quality of your final draft. This can then lead to a smoother flow of moving service provisions which can utilize and make the most out of the usage of the business’s efforts, time, and resources. If you are a client who wants to maximize the usage of a moving company contract, you have to ensure that all the details about the moving transaction are complete, accurate, and updated. As much as possible, make sure that the document is error-free so you can veer away from facing disputes and misunderstandings in the future due to misleading, vague, and/or inaccurate information. 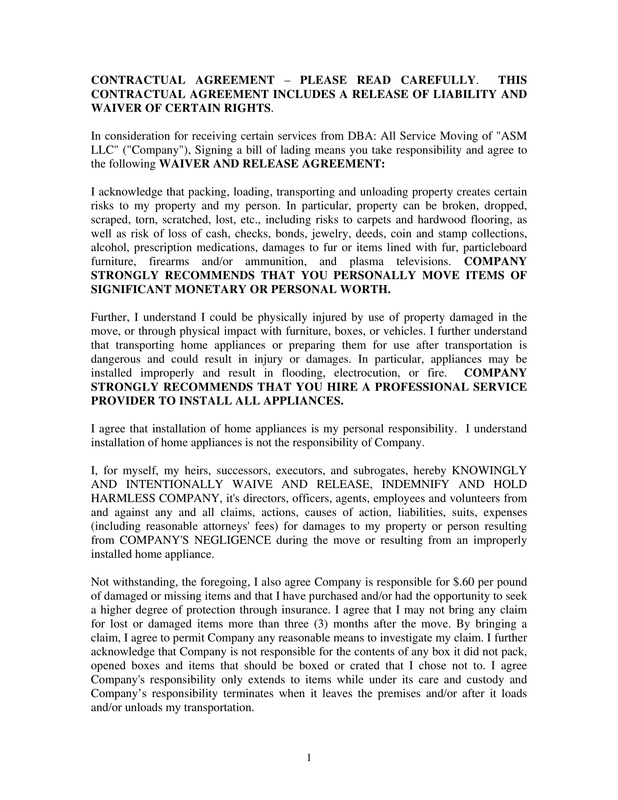 You can add a termination clause and a contract termination letter as an attachment to the actual moving company contract so you can let the other party know that the rights of each entities are highly considered and that the responsibilities and obligations of every party to one another are taken seriously. 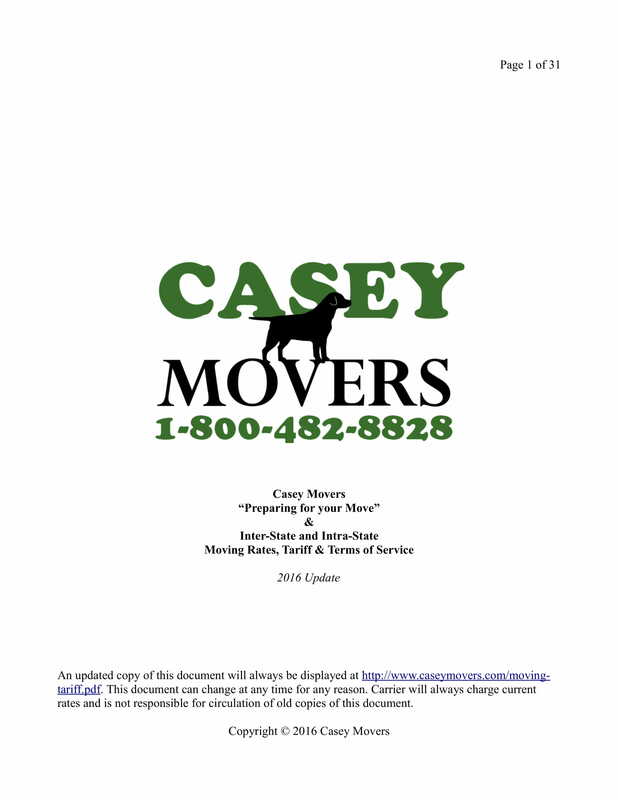 Use references when making a moving company contract and also learn how to limit the items or features that you will copy or use. 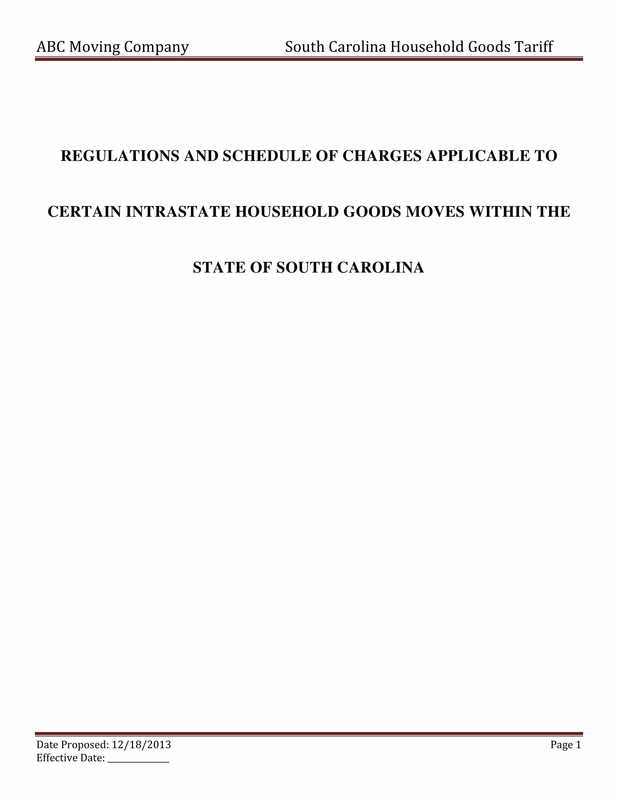 Not everything that you see in templates, examples, and other guide documents that you will refer to must be seen in your own moving company contract. Learn how to maximize the usage of your references based on the needs of the contract that you would like to have. If you think that you have already gathered the necessary information and guidelines that you need for the development of a comprehensive moving company contract, then by all means try to start the drafting processes for the specified document. With your knowledge about moving company contract development and the availability of the template examples in this post, it is highly possible for your output to be detailed, functional, and relevant.